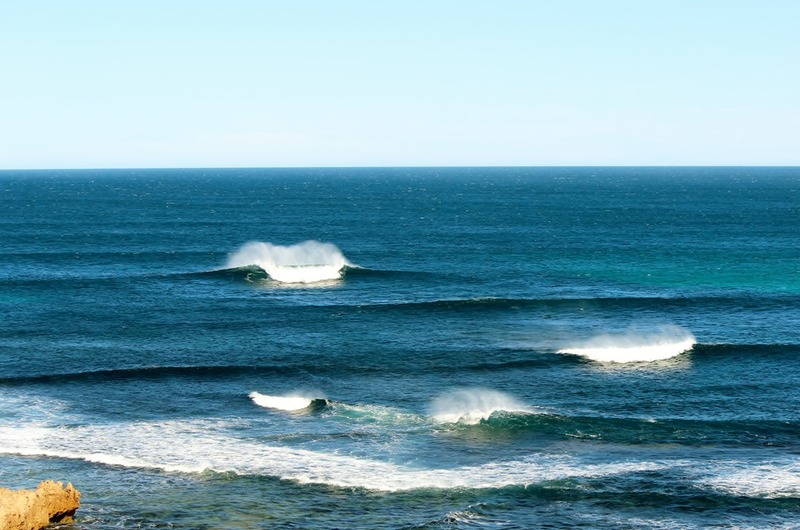 Our Spring weather has finally arrived and soon we will be back on the sparkling Southern Ocean waters. We managed to get the kayaks launched a number of times over the Winter period, however, there were no truly memorable paddles and few perfect photo opportunities, so we kept ourselves busy, including some Mountain Bike touring in Northern Australia (see our photos here). 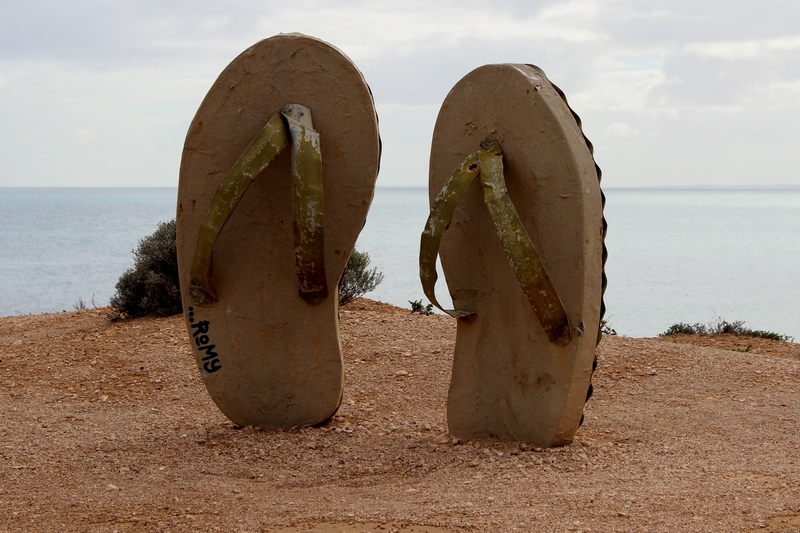 As Spring weather arrives so does one truly Australian dilemma. What do you do when your tearing down a mountain bike trail and find your self face to face with a highly venomous Eastern Brown Snake. Heads or Tails, Heads or Tails. Aim for the Head and they’re less likely to be able to rear up and strike. Aim for the Tail and you might just get around the back of him/her. Some try to “bunny hop” the snake, some grab all brakes and spear off the track. 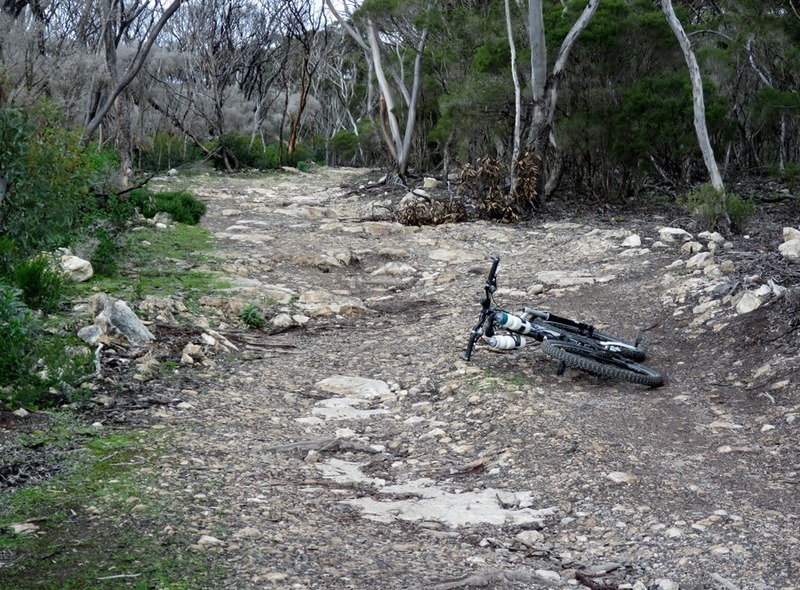 Of course that’s fine if your going downhill, but our luckless rider was going up an exhausting 5 km. dirt track climb and wasn’t exactly carrying much speed. Head down, pounding away on the pedals Robyn finds her front wheel is just 50 cm. from a big fat 2 metre Brown Snake. GO TAILS AND HEAD OFF TRACK. She wins as the snake scurries across the track, looking back at her as she picks up the bike and heads off. 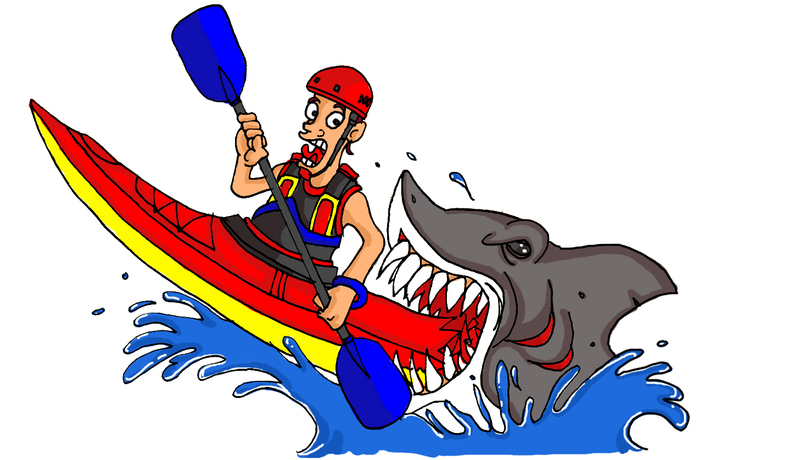 Now what’s the rule for Kayaks and Great White Sharks ?. Sit quietly and hope they don’t notice you or paddle to shore at lightning speed. Hope I don’t have to find out which one works best. 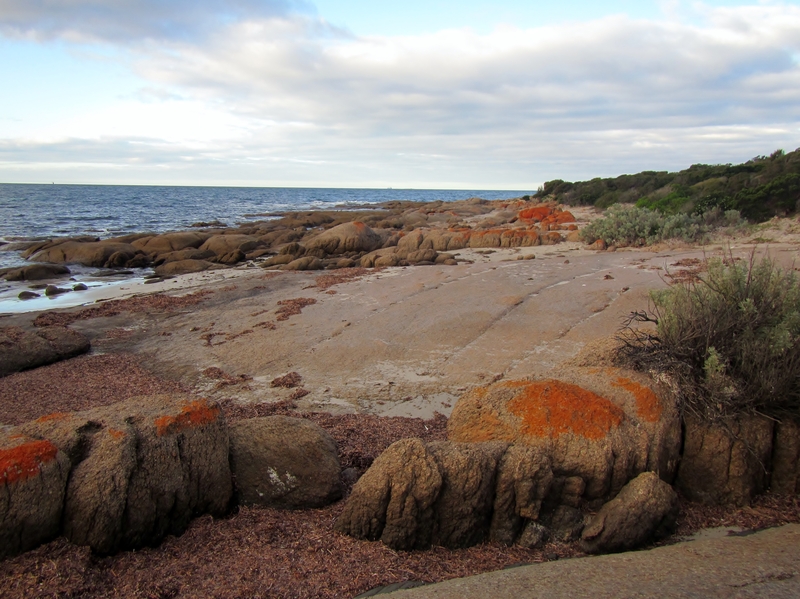 Yorke Peninsula is a great place for kayaking, with beaches that range from mild to wild and lots of rocky coastline to explore. We have spent many years wandering the coastline, calling in at the various small towns and enjoying the less populated areas that kayaking gives you access to. However, this trip we decided on something a little different. 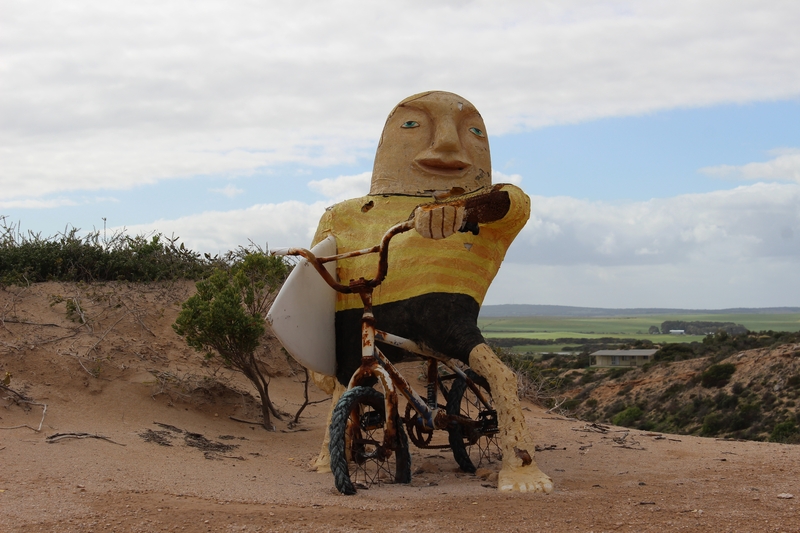 The Walk the Yorke 500km walking and cycling trail has just been opened from the town of Port Wakefield to Moonta Bay. It follows the coast in most places with lots of beaches to traverse by walkers. For bikes it follows the coast as near as possible. So off we set on our Focus MTB’s and BOB trailers, with the intention of riding in the morning and exploring in the afternoons. We spend 11 days riding the “Walk the Yorke” which has some great scenery and variable trail conditions. Hope you have time to head over to our CafeVatican site to see lots more photos. This link takes you there. I’ve always been fascinated by seascapes and visiting new areas has been a great part of my enjoyment of sea kayaking. 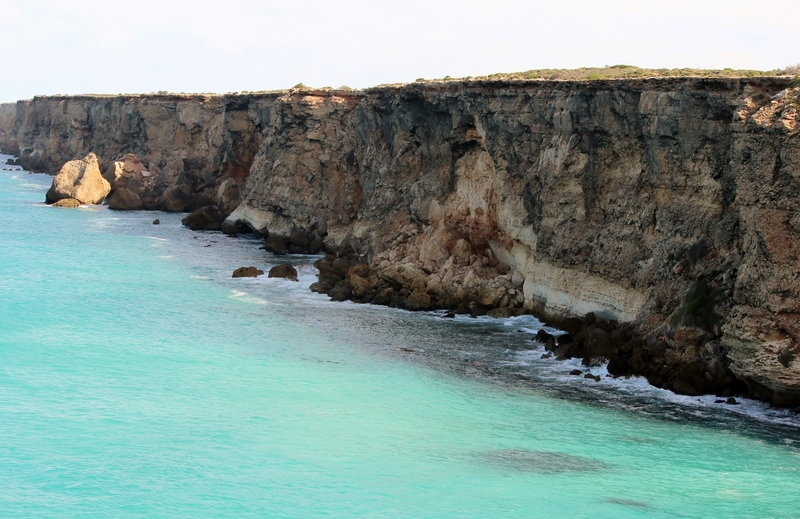 The Great Australian Bight certainly gives plenty to appreciate and here is just a small taste. 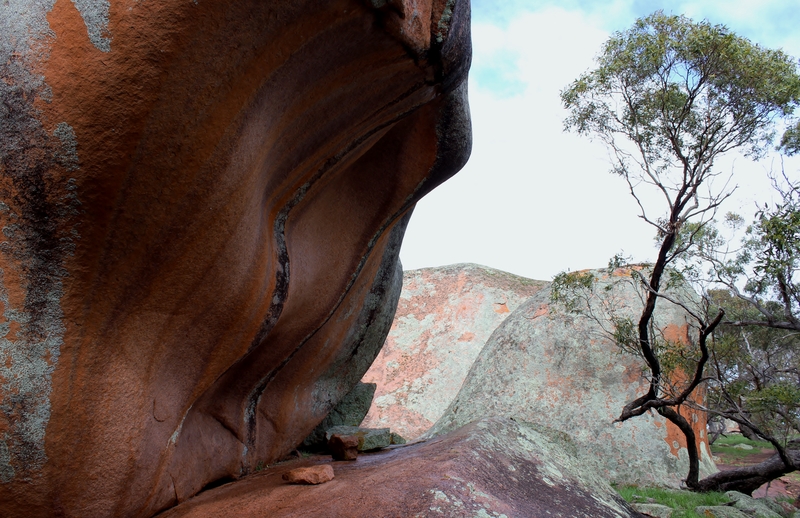 Often the elements sculpt the landscape into interesting shapes. 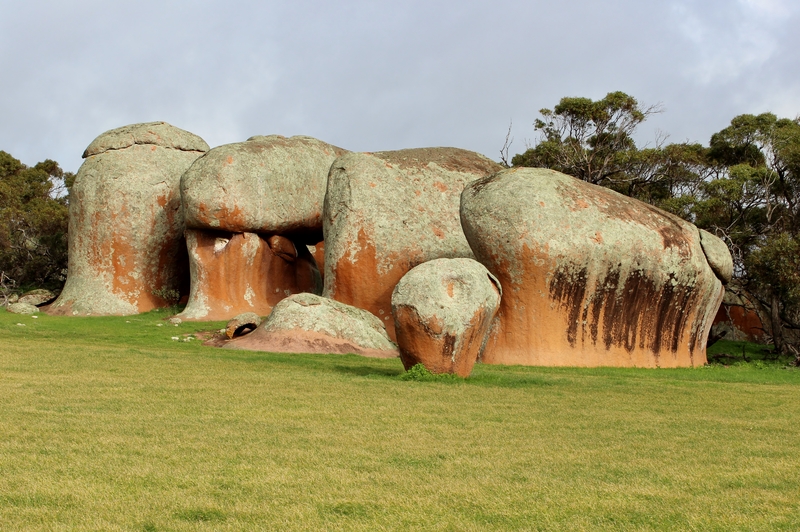 Murphy’s Haystacks look like old time haystacks and the nearby granite is sculpted into various wave shapes. 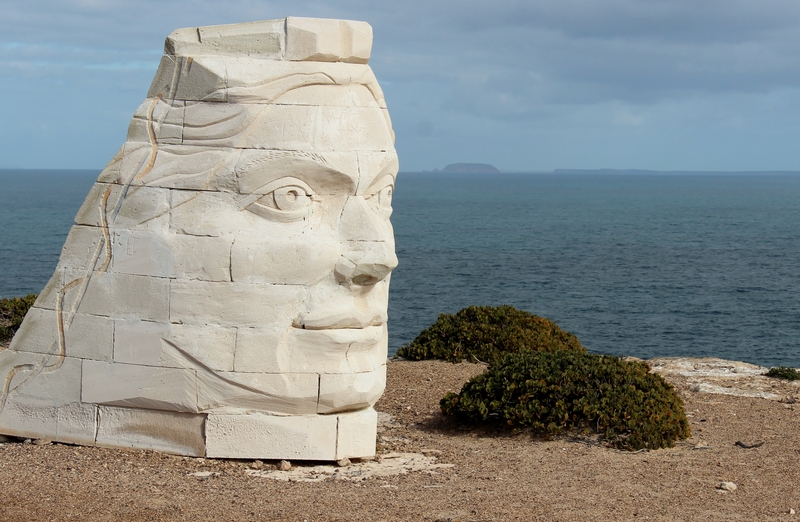 Other places have ever changing natural sculptures. 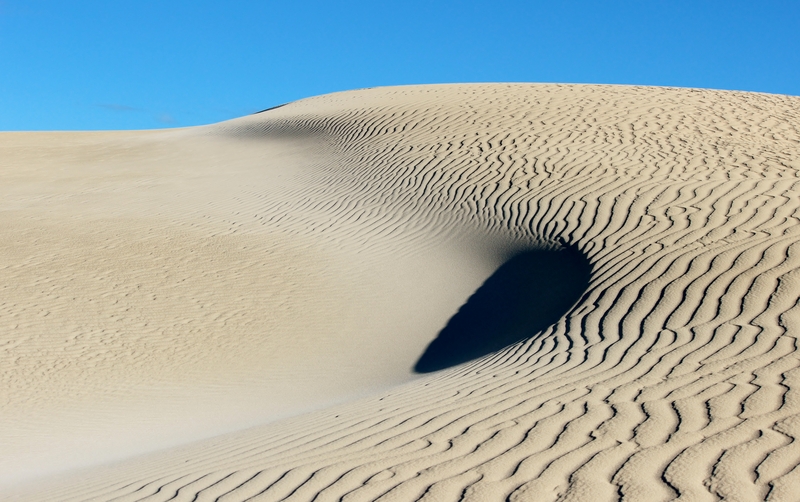 And sometimes man leaves things to slowly blend into the landscape. 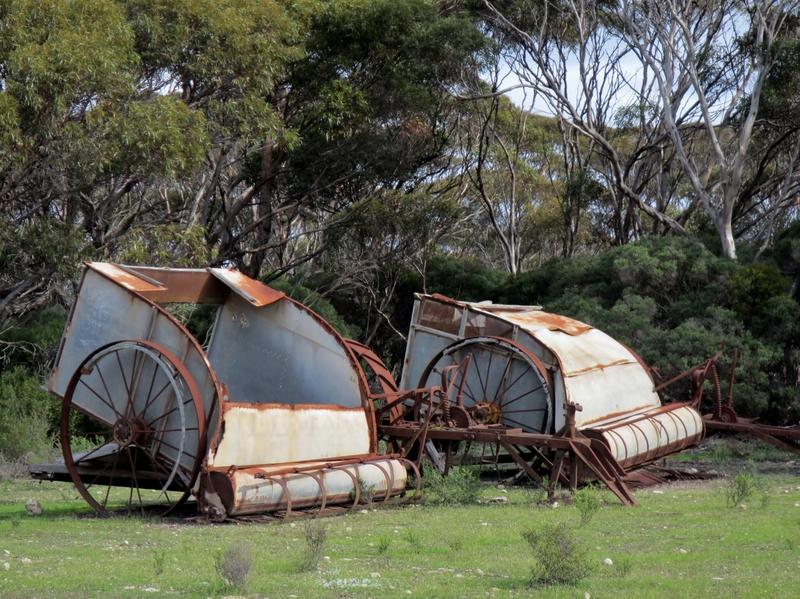 Not every old piece of equipment is in decay. 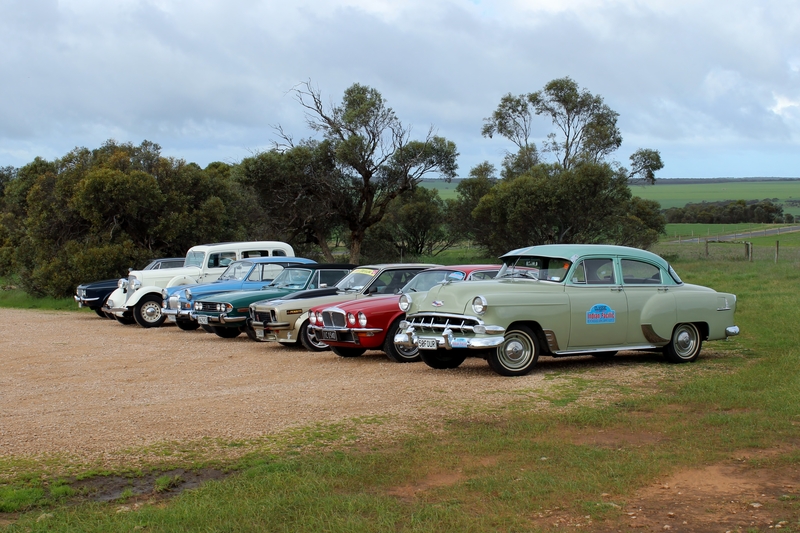 We met Wes Davies who organised a classic car run from Perth to Sydney via the scenic route. Wes was a sheep buyer in this area in his younger days and now as a publisher and classic car fanatic in New Zealand, he shows others the beauty of the area in a truly classic way. I’ve always thought that certain cars from the 1950’s and 60’s had sculptured lines and a beauty of their own. Perth to Sydney Vintage Car Rally. On the road again, this time in mid winter and for the first time in years, without a kayak on the roof rack. 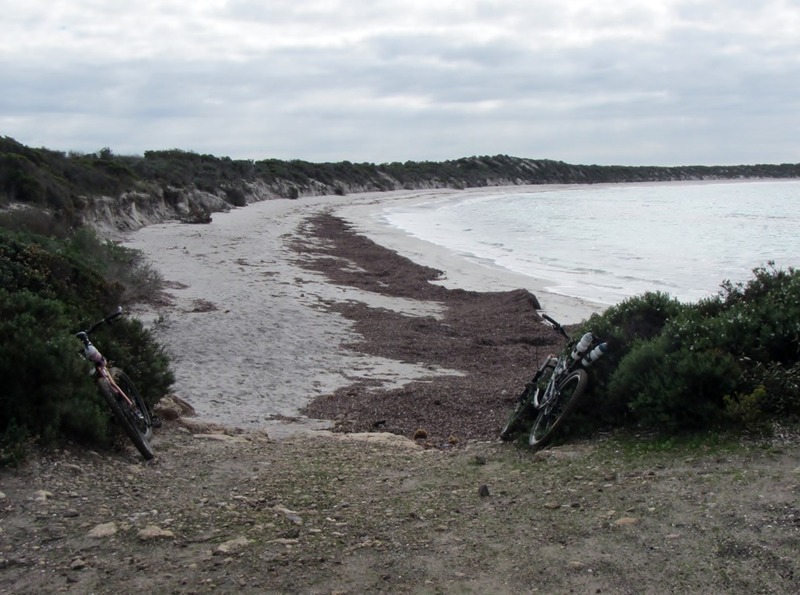 Decided that the winter weather was just too changeable in the Great Australian Bight to consider launching kayaks, so it was pedalling not paddling. The idea was to check out a number of launch sites for future expeditions as well as spend time in places we often pass through but rarely have time to explore. 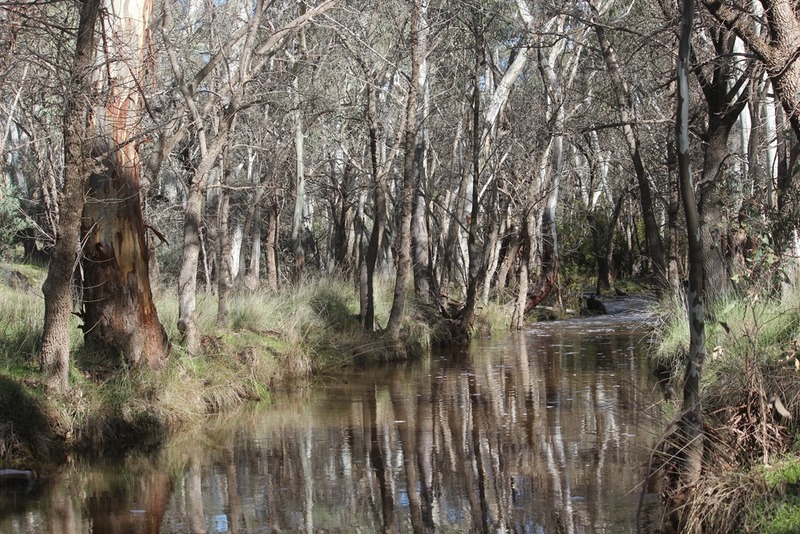 We spent a couple of days in the Wirrabara Forest Ippinitchie Creek camp ground. A great place to stay and ride the surrounding forest tracks and even better when you are the only one there. 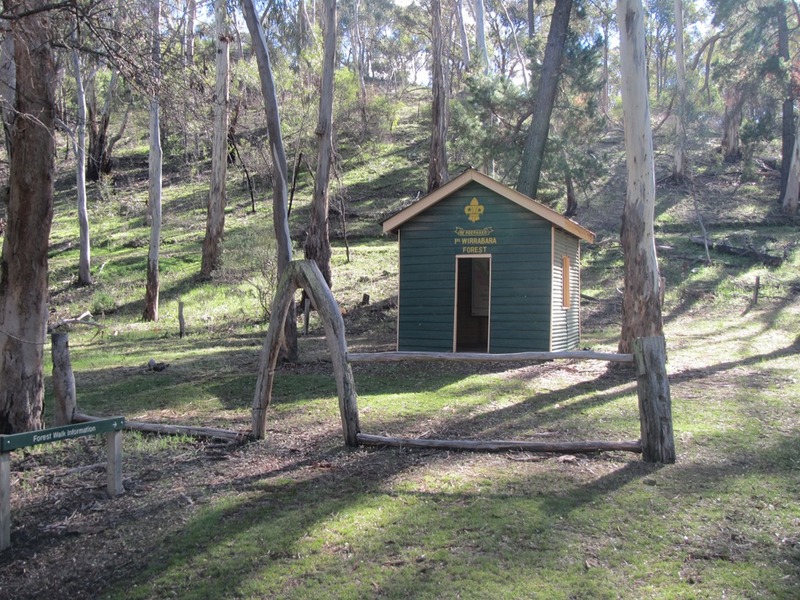 Some time ago, the nearby community of Wirrabara Forest must have been thriving with a tennis club and scout hall. This is all that remains. After another stop along the way at Melrose, to ride a few of the famous mountain bike trails, we headed for the Gawler Ranges National Park. 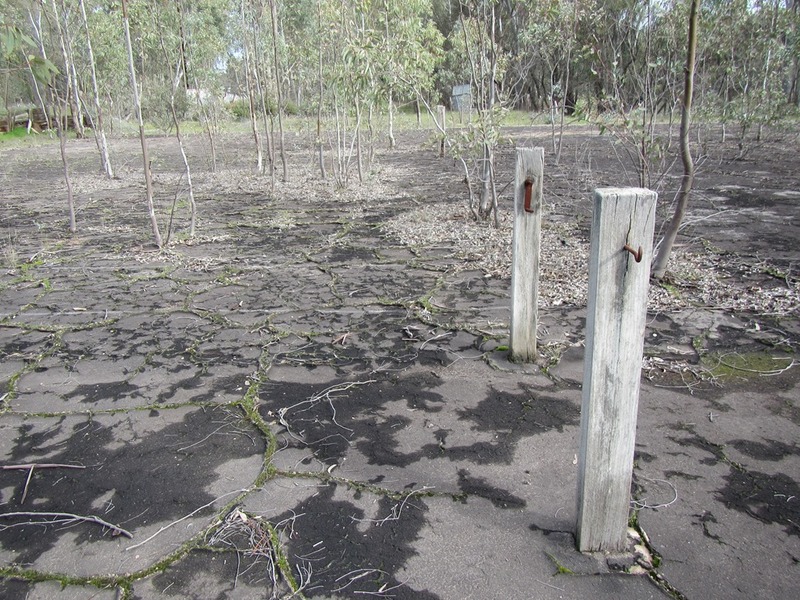 Unfortunately we were hit by severe rain storms soon after we left the bitumen road which turned the track into a stream of mud. Very interesting driving when the Toyota Prado and the camper trailer are going sideways down the road and the mud reaches up to the doors. 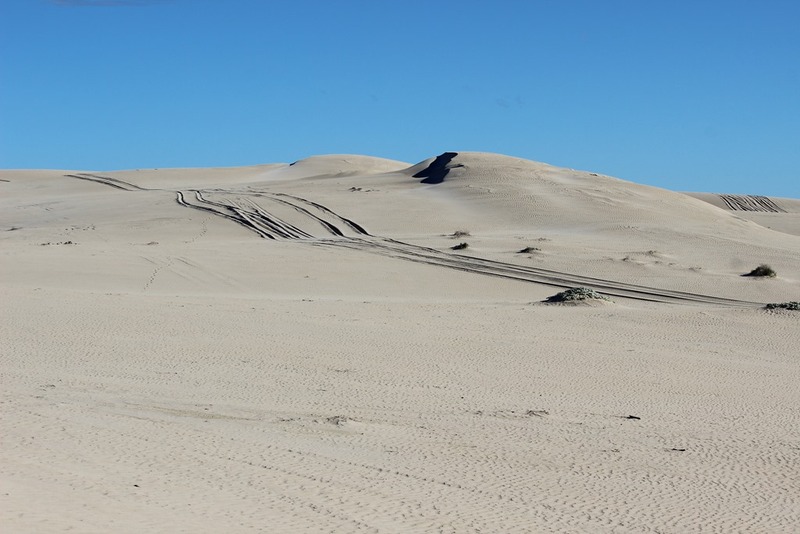 After a couple of hours in slow 4WD we hit the bitumen again and headed further across the Nullarbor Plain. For those who don’t know the area, this is a vast flat treeless plain stretching 1100 km. 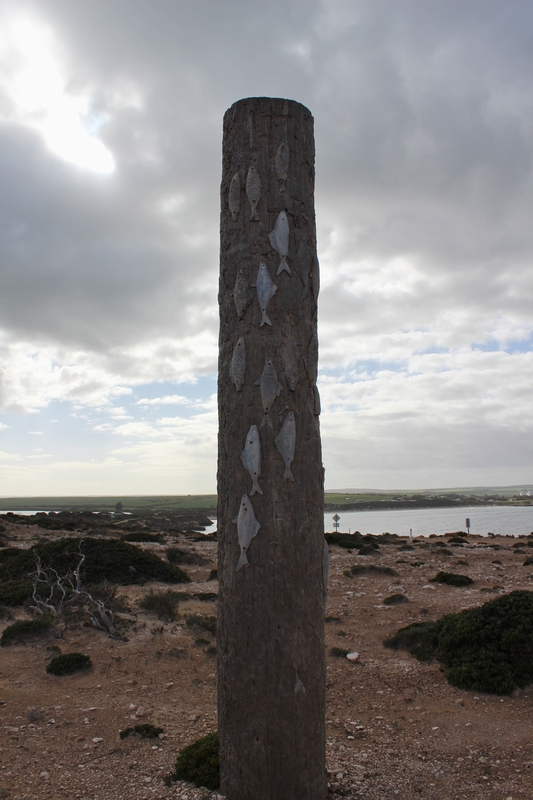 across the Great Australian Bight, covering an area of approx. 200,000 sq. km..That’s about 1 1/2 times the size of England or 1/4 the size of Texas. 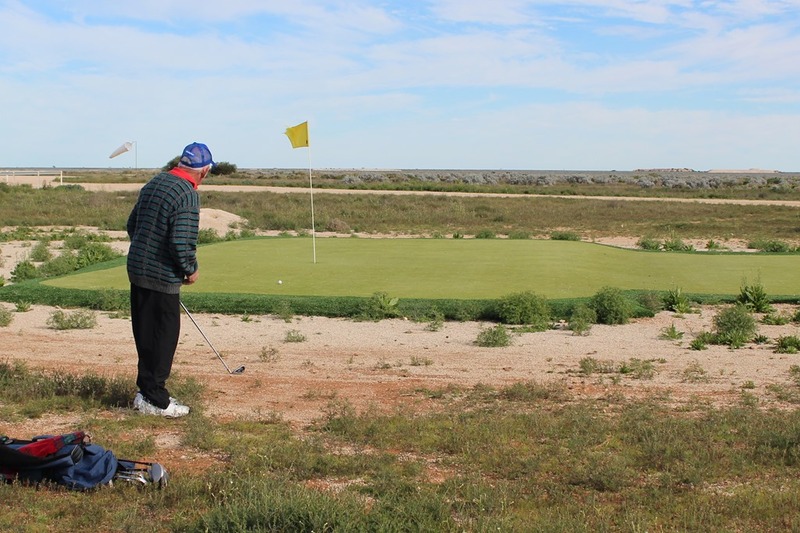 It’s other claim to fame is the worlds longest golf course with one hole played at each town across the Nullarbor. The greens are artificial turf and the rough is horrendous salt bush. The other problems, apart from losing your ball, are snakes, other bities and at Nullarbor Roadhouse the airstrip cuts across the “fairway”. Chipping onto the green on the 3rd hole. 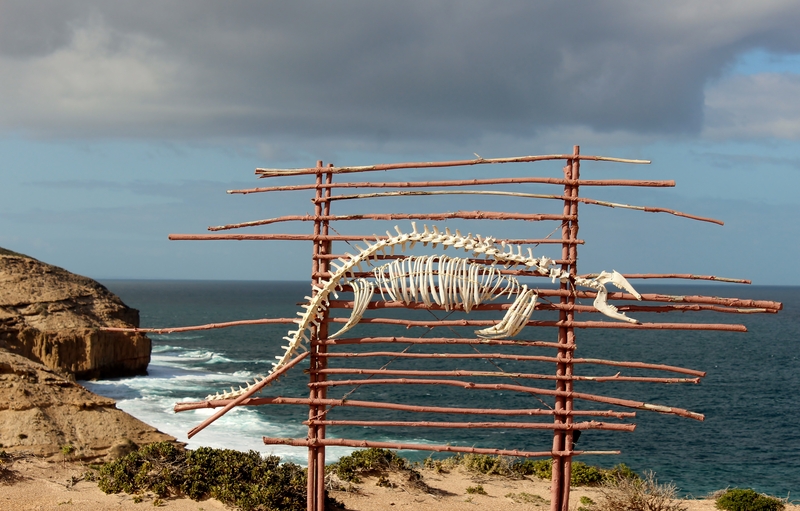 At the head of the Bight we found about 30 Southern Right whales, many with calves lolling around at the base of the cliff. We were also lucky enough to see 2 recently born albino calves. Less than 2% of calves are born albino (white) however they do gradually turn dark as they grow up. 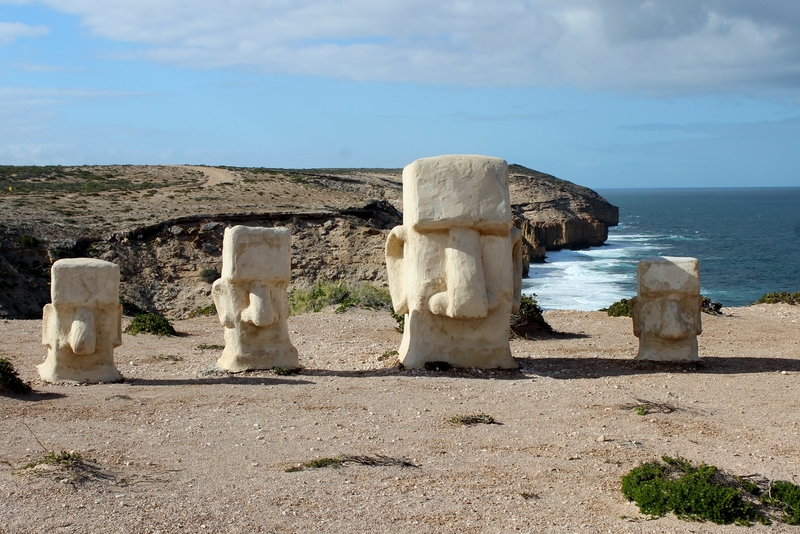 We also visited a number of areas that I had surfed over 20 years ago. 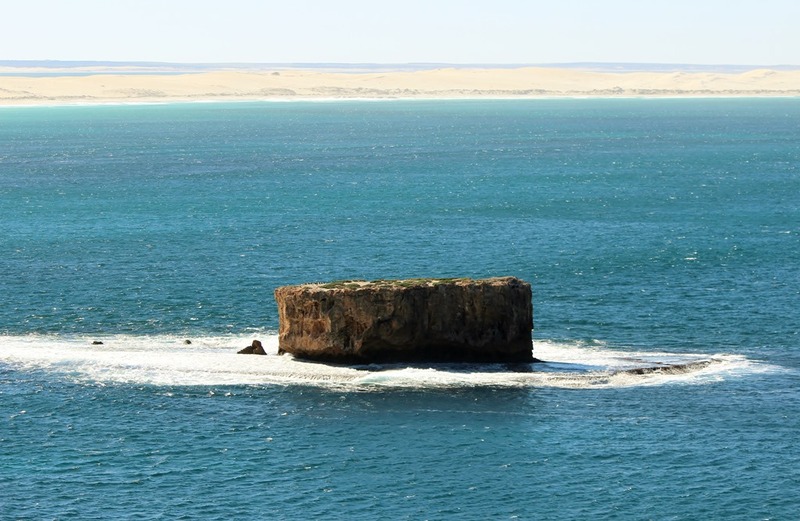 The waves in this area are fantastic and extremely powerful however this trip the swell wasn’t large enough to produce the waves that places like Cactus and Granites are famous for. 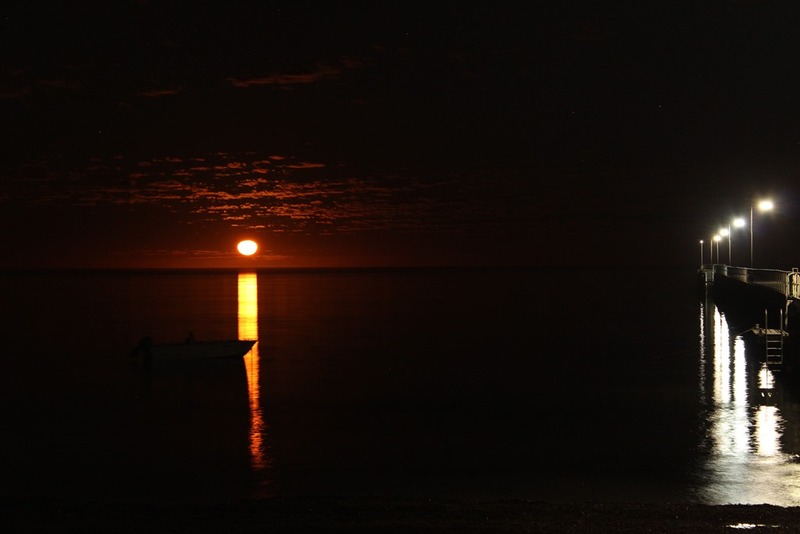 Spent a few days off the beaten track in Fowlers Bay area which is a nice area for a spot of fishing and whale watching as well as enjoying the sunsets and moonrises. This track had some natural hazards. 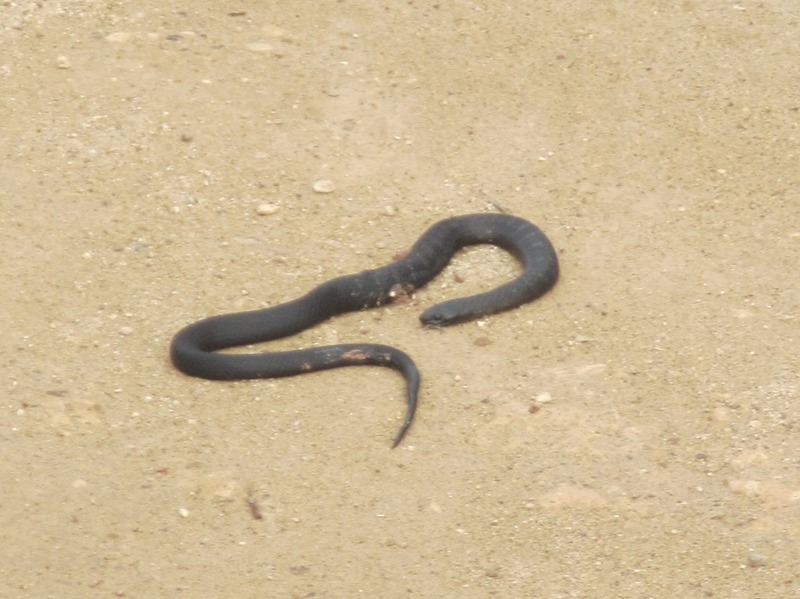 Firstly a black snake on the track…..
And then I had an unplanned dismount when I startled 2 Emus who bolted in front of me. Things got a little interesting with 200 kg of bird flashing across the handle bars. The track ended at McLarens Beach, another perfect and deserted destination. Later we rested near the waters edge only to see a Whale lolling about in the shallows of the bay. 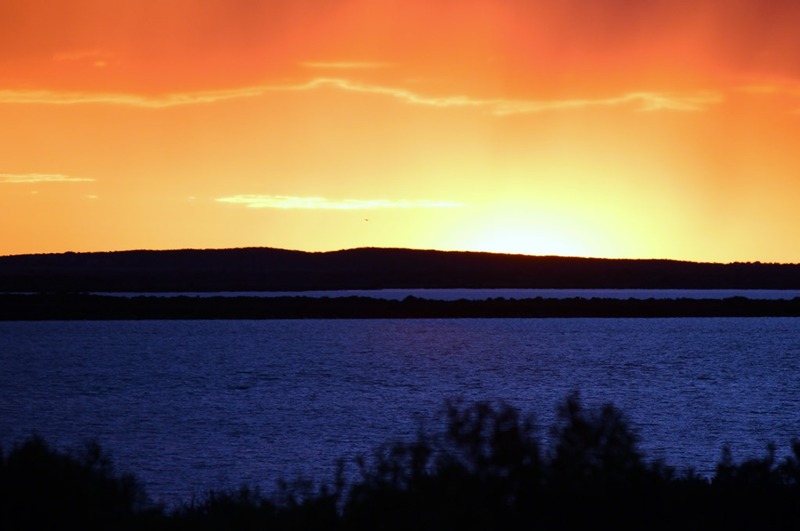 Of course there was the usual list of animals including the Port Lincoln Parrot, Blue Wrens, Currawongs, Sea Eagles and nightly visits from Emus and Kangaroos. We have Paddled for many years, Pedalled for lots more and lately we have found an interest in Photography. 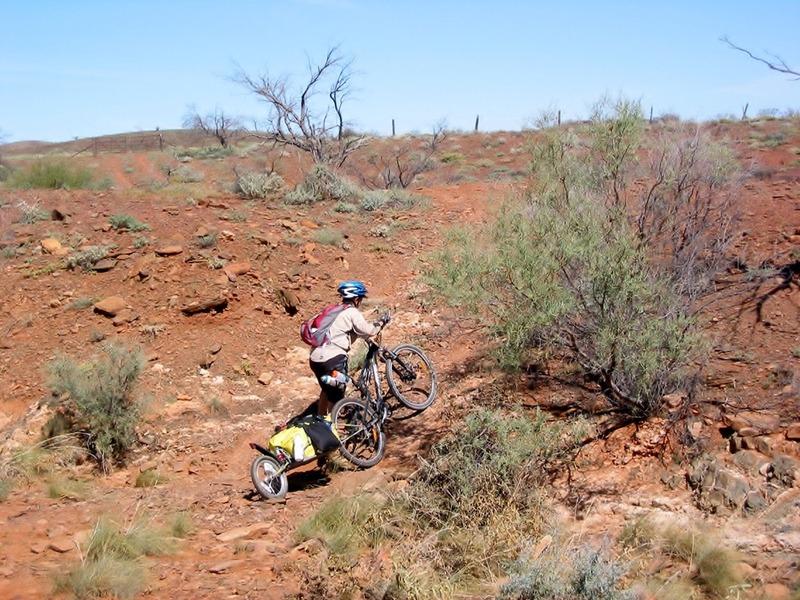 Now we have the 4th P – Publishing- with an article published in Lets be Wild magazine about our bike trip along the Copper Trail in the Northern Flinders Ranges. 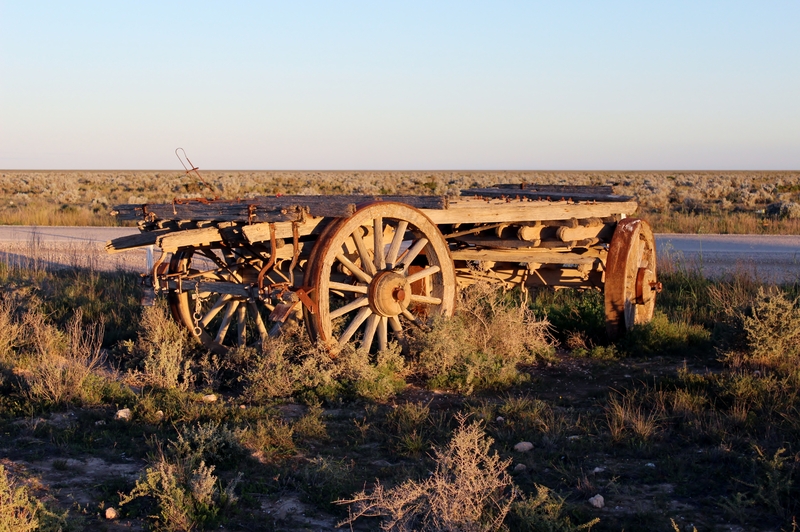 Check out the article of our bike adventures in the North Flinders Ranges, published in Lets be Wild travel magazine, See it here. Robyn, Michael, Gavin and I have just returned from the Barossa Valley where we rode in the Tour Down Under Community Ride with about 7000 others who followed the route of the professionals over Day 4 of the race. 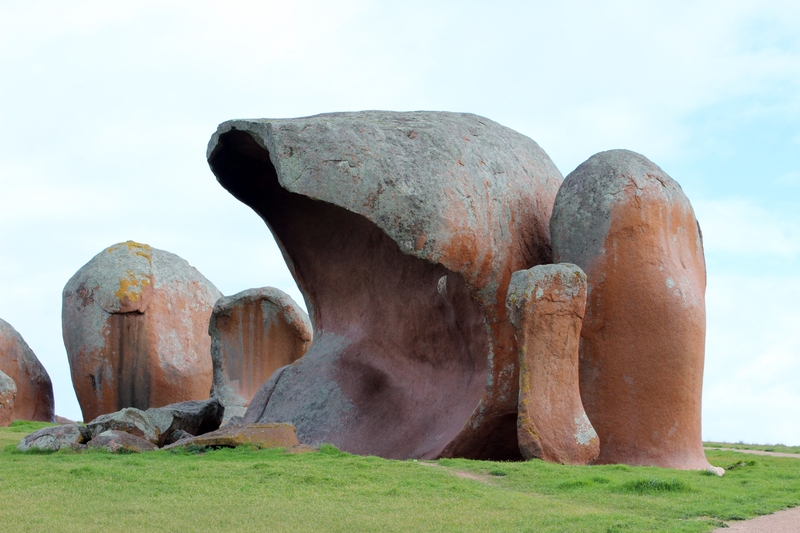 We stayed an extra couple of days in the Barossa wine region to make it even more enjoyable. We are now planning the next outback bike trip for this coming Autumn. With the TDU ride out of the way, we can concentrate on paddling the S.A coast again, except for Gavin who has decided that a couple of months exploring the Tasmanian coastline will be beneficial to his health. 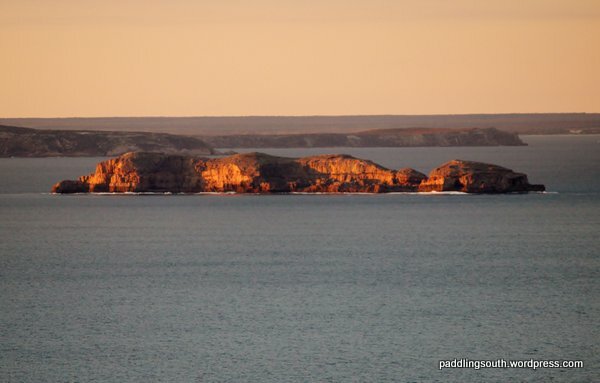 Plans are made for February, and March is now full, with 3 weeks paddling the west coast of South Australia , on the edge of the Great Australian Bight. 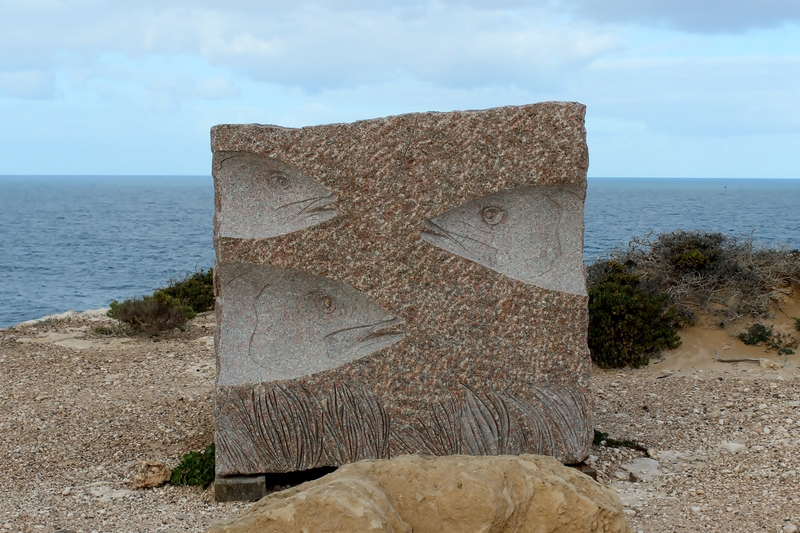 We will be joined by Matt and Kathrin from Germany, who are keen to swim with seals and dolphins, and will be visiting and paddling areas between Streaky Bay and Pt Lincoln. 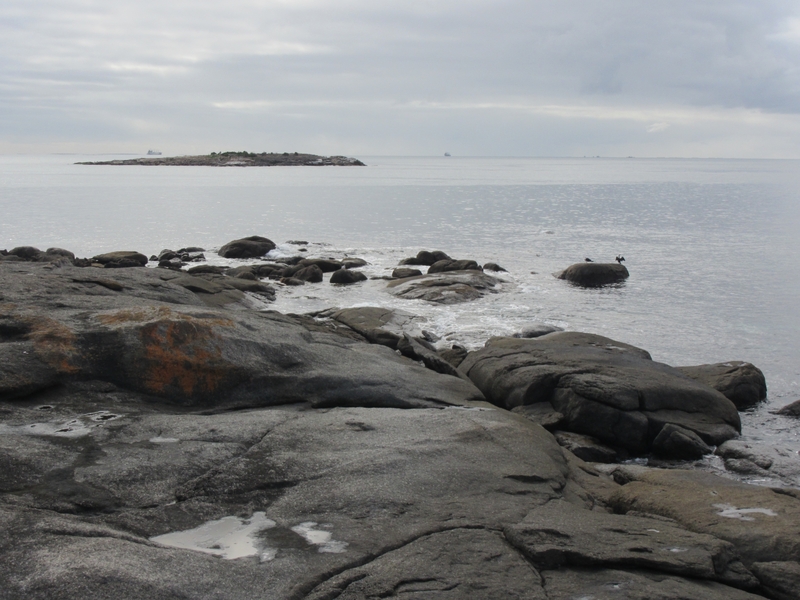 Hope to visit Sea Lion and Fur Seal colonies around Baird Bay, Pt. Labatt on the west coast and Hopkins Island offshore from the Memory Cove Wilderness area. The trip should make for some good photos and great paddling adventures. Should I tell them that swimming in a seal colony in a black wetsuit, near a White Pointer Shark breeding ground might have a possible drawback ?